In an area rich in historical sites, Knappogue Castle in Co Clare, combines luxury rental accommodation with the heritage of Ireland’s turbulent past. In an area rich in historical sites, Knappogue Castle in County Clare, combines luxury rental accommodation with the heritage of Ireland’s turbulent past. The castle, which was originally built in 1467 by Sean Mac-Con McNamara and contains additions from the 18th and 19th centuries, provides luxury accommodation in a self-contained private apartment. You will be in good company here, as in recent decades two presidents of Ireland and other heads of state, including Charles de Gaulle and Ronald Reagan, have enjoyed the sumptuous guest accommodation. It is beautifully appointed, with antique furniture and paintings and overlooks the formal garden. The castle has been extensively and sensitively restored and is available for conferences, incentive groups and corporate entertainment. Mediaeval banquets are held in a separate part the building from April to October. 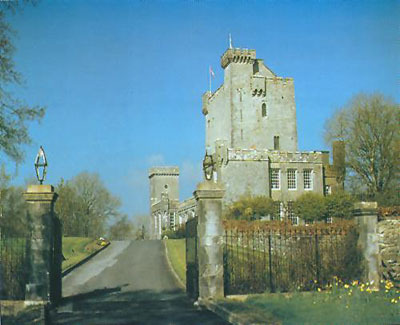 From mid-October to mid-April the castle is the venue for unique, mediaeval-themed wedding receptions. The apartment is on two levels and is reached by a flight of stone steps. Accommodation includes a drawing room with fireplace and grand piano. Oak sitting/dining room with fireplace. Full kitchen and small office area. Two king-size double bedrooms with one en suite bathroom. Two twins (two beds), both en suite. One further twin room. One further bathroom. Continental breakfast, daily cleaning and heating included.